Sound (8.5/10) – The Astrotec AX-35 is a dynamic + single BA hybrid earphone that utilizes a Knowles ED armature driver and competes with the likes of the T-Peos H-100 and Dunu DN-900, albeit at a significantly more attractive price point. The signature of the AX-35 is somewhat v-shaped thanks the combination of bright, energetic treble and the mild mid-bass emphasis of the dynamic driver. Though I wouldn’t call it bass-heavy, the AX-35 does have good low-end presence and punch. Its bass is not the deepest but the mid-bass emphasis is greater compared, for example, to the dynamic-driver VSonic GR07. The GR07’s bass is a bit tighter but less emphasized in the mid-bass region, and less impactful as a result. In fact, the overall bass quantity of the AX-35 is closer to that of the GR07 Bass Edition. This does result in the low end being less tight compared, for example, to the MEElectronics A161P, which is also based on the Knowles ED balanced armature, or the VSonic VC1000, but it also means that the bass quantity will suit a wider range of listeners. Indeed, improving on the bass response of single BA systems is one of the usual motivations behind hybrid designs such as this one, and the AX-35 does succeed in delivering bass. The enhanced bass of the AX-35 combines with the thinner note presentation of its midrange to give the earphones a slightly v-shaped sound. Clarity is limited by the mid-bass but the AX-35 still manages to keep up with the more mid-forward Ultimate Ears 600. It lags behind VSonic’s higher-end GR07 and VC1000 models, both of which are more balanced-sounding and neutral in tone. The VC1000 especially makes for a stark contrast to the AX-35, with its strong mids making the Astrotec unit sound withdrawn and distant in the midrange. At the top, the AX-35 has good presence and energy, falling a bit on the bright side of neutral. The treble sounded better to me at lower volumes but the mids aren’t quite strong enough at those same volumes for my liking, so I ended up taming the top end with foam eartips instead. The treble character is not unlike that of the MEElectronics A161P, which is based on the same BA driver – a little harsh and unrefined, but overall not far behind popular higher-end sets such as the VSonic GR07. What sibilance does show up can be tamed with the right eartips. The presentation of the AX-35 is wide, with good air and separation between instruments. 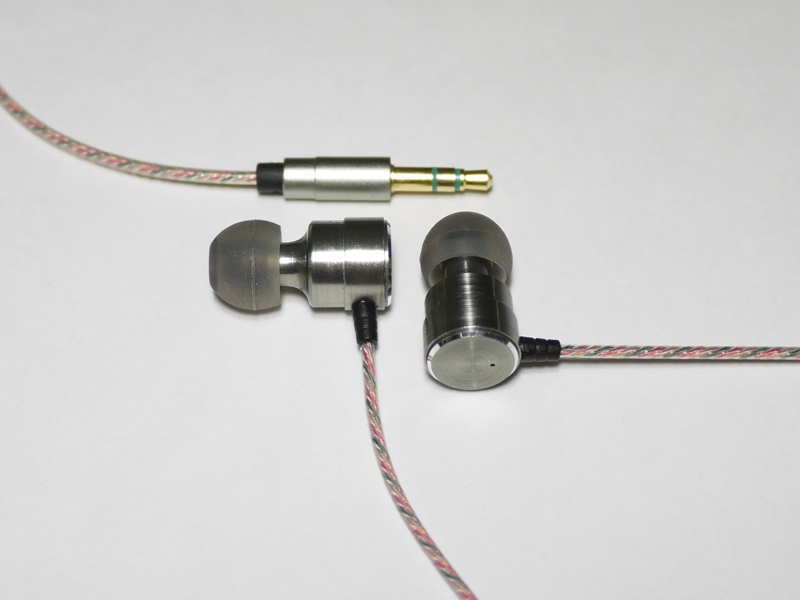 Earphones such as the Ultimate Ears 600 and MEElectronics A161P, which have more forward presentations, sound overly intimate next to the AX-35 and lack both soundstage depth and separation in comparison. VSonic’s entry-level VSD1S is a dynamic-driver earphone with a slightly v-shaped sound signature. It has more bass, especially mid-bass, than the AX-35, which gives it a warmer tonal character but takes away from the midrange clarity. As a result, the AX-35 is clearer. It’s also brighter in tone, though the VSD1S is by no means dark-sounding. The VSD1S tends to be a little more sibilant while the AX-35 is a little splashier. The AX-35 has a slightly wider presentation, though the VSD1S is no slouch. The Fidelio S1 offers up a more balanced sound while the AX-35 tends to be more v-shaped in response. The Astrotec unit has more bass but the extra enhancement comes in the mid-bass region, so it doesn’t have an advantage in bass depth. The Fidelio S1 is more mid-centric in comparison and has fuller, more fleshed-out mids while the AX-35 is a little thinner-sounding. Neither unit is especially smooth in the treble – the S1 has some emphasis in the lower treble region, which gives guitars a characteristic crunch, while the treble emphasis of the AX-35 comes in higher up, resulting in a slightly more sibilant sound. The AX-35 has a slightly more 3-dimensional presentation with better layering compared to the Philips, and is also noticeably more efficient. The sound of the HiFiMan RE-400 is more midrange-focused compared even to the Philips Fidelio S1, so it provides a very striking contrast to the more v-shaped Astrotec AX-35. The AX-35 is bassier, but the RE-400 has a tighter, more controlled low end. The slightly looser bass and more recessed midrange of the AX-35 together cause it to sound more veiled than the HiFiMan set. The RE-400 is also very smooth at the top, whereas the significantly brighter and more energetic AX-35 can sound both harsh and sibilant in comparison. The AX-35 has a wider presentation than the RE-400. Compared to T-Peos’ pricier H-100 hybrid, the AX-35 has a more conventional sound signature that should be less polarizing among listeners. It sounds fuller and has more bass than the H-100, albeit with a little more bloat as well. The H-100 sounds thinner and more scooped-out in the midrange, appearing a little clearer but also less natural from a tonal standpoint. The AX35 is more neutral and its presentation is less distant with better depth/layering. Its treble is surprisingly a little less forgiving than that of the brighter H-100, but overall I still think the majority of listeners will prefer the more inexpensive Astrotec unit. Dunu’s DN-900 is another dual-driver hybrid, one that boasts fantastic deep bass but has only so-so clarity. The AX-35 can’t match the sub-bass prowess of the DN-900 but has similar overall bass impact. The DN-900 sounds a little thicker throughout but that doesn’t do its midrange any favors – it’s significantly muffled compared to the leaner AX-35. The Astrotec unit sounds more detailed and has brighter, crisper treble. The presentation of the two is about on-par but there’s just no making up for the comparatively poor overall clarity of the Dunu set. Value (9/10) – Not only is the Astrotec AX-35 one of the most reasonably-priced hybrid designs on the market, it manages to skimp on none of the qualities that made me a fan of the lower-end Astrotec earphones – a polished design with great attention to detail, sturdy construction, and excellent user-friendliness. It makes for a very enjoyable listen, too, and the slightly v-shaped signature seems to particularly excel with electronic music. Hi you recommended me the dn-2000 which I really enjoyed the best earphone I have purchased however lost them on holiday and gutted. I was debating to buy them again love the sound signature though I would to better the dn-2000.what would you recommend. Hi Joker great review! Just wondering how these compare sound wise to the jvc fxt90 (another v shape sound It seems). The shape/style of the AX35 seems to be the type that fits well in my ear. The housing of the JVC seems kind of quirky fit in the ear. The AX35 is brighter and leaner than the FXT90. The JVC with its dual dynamic drivers is bassier, warmer, and just more rich and full-bodied overall despite still having a somewhat v-shaped signature. The AX35 is better compared to the JVC FXD80, which has a more conventional form factor than the FXT90 form factor but still sounds a little more natural than the Astrotec in my opinion. Thanks Joker for your input which is always well respected! Hi. I posted this question on head-fi, but it is dead there. May I ask, about your opinion? : Any impressions about how these make a pair with colorfly c3? I like the analytical sound that colorfly delivers, and I’m interested if the ax30 or, ax35 would sound nice with it. I listen to the wide range of styles, so I would prefer something well balanced. Since these are very affordable on aliexpress, I”d like to try them. I listen a lot of minimal music (glass, nyman) and I wonder, If ax30, or ac35 would be better for it? Thx joker. I dont need absolute flatness :). I think for the price of $50 I wont find anything better – and nicer. If these are ok with classical , I would be ok with them. My last earphones were fake ie80 and I was pretty happy with them. I would think even fake IE80s would have a bassier, warmer sound than these but that’s just guesswork. For $50 they’re quite nice. I have them about two weeks, they’ re great iem. But I would not say that, if I wouldn’t own Aune T1. With Colorfly, they sound thin (that’s quite interesting, because with takstar hi-2050 the colorfly sound very, very good and non-fatiguing), non-vivid + hissing is quite noticeable. Can I ask once more question: would you reccomend (budget-wise) the new Fiio X1 or TOPPING NX1 or SMSL sAp-5 for they’re sound signature? Sorry, I am not familiar with those products so I’m not sure which would mesh best with the AX-35. How would the astrotec ax35 stack up against the jvc ha fxd80? Lows, mids, highs. Would the astrotec unit be too bright with the regular silicone tips, I do not wish to keep purchasing foam tips. Would the astrotec unit be OK for streaming music (tunein radio) or are they too detailed for such low bit rates (128 mbps)? I want the astrotecs but you said that they are rather bright. Both are somewhat v-shaped sounding; the FXD80 is bassier and sounds a little more mid-recessed while the AX35 is more balanced, but bright with stock eartips. I felt that the FXD80 is more forgiving and that’s the one I’d go for with your requirements in mind. I am looking to replace my Vsonic vsd1s and I am currently choosing between the astrotec ax-35 and the steel series flux. Which would you recommend for me? I listen mostly to folk (Ed Sheeran) and to rap(Kanye). It really depends on what you liked about your VSD1S, and what you don’t mind seeing changed. Both have less bass than the VSonics but the AX-35 is brighter and clearer whereas the Flux is more smooth and warm-sounding. I am looking to replace my vsonic vs1ds and I am currently choosing between the Astrotec AX-35 and the Steelseries flux. Which would you recommend for me? I listen mostly to folk (ed sheeran) and to rap(kanye). The FXC80 is quite an old earphone, bright, but rather clear. It was somewhat fatiguing to me so I wouldn’t recommend it over the AX35 or S1. I reviewed the S1 here: http://www.innerfidelity.com/content/philips-fidelio-s1-and-s2-ear-headphones and of course also compared it to the AX35 in the review above. Sorry that I wasn’t sure if you did that review of S1 since it’s on a different place. I decided to go with the S1 in the end, mainly because I noticed that I can receive it about a week sooner 😛 (so basically I did not set my mind on which one I want more). One more question if you don’t mind: you have said that the S1 is tough to fit, does that mean you would not recommend using it when travelling because the isolation is probably not great? Isolation is average – if you use the included Comply tips it’s alright, but still far from the best. Ok on a bus, not great on a plane or subway. Thanks for the insights. At least I know how to use them now XD. I’ve got the AX35 and have modded them a bit – taped both vent holes and added a 75ohm adapter. This evens out the bass, improving sub-bass vs. mid-bass balance. It also brings the kids forward a bit, which makes them better for vocals. I was wondering how the AX35 compare to the Yamaha EPH-100 in two ways… 1) SQ for general use across a wide variety of music. 2) Nozzle size – wondering how much bigger the nozzles are on the EPH-100 than the AX35. Final question: Which would you recommend for maximum musicality – Astrotec AX35, Dunu DN1K, Philips S1, RHA 750, or Yamaha EPH-100 – and why? Thanks for your time and insight! Um, I meant it brings the mids forward – not brings the kids forward, lol. That sounds good, should help. Can’t find my impedance adapter right now but I can see closing the vents getting rid of some of the mid-bass hump and the impedance adapter evening out the mids with the top end. The EPH-100 nozzles are maybe 15% wider, but probably not even that much, which is surprising considering the driver is supposed to be inside the nozzles. Generally, the EPH-100 has a lot more subbass and some more mid-bass (compared to an unmodded AX-35, of course) with less presence in the upper mids and generally smoother/more relaxed treble except for an upper treble lift/peak, which doesn’t really bother me. Musicality may mean different things to different people but generally seems to indicate warmer, bassier, more full-bodied sound. Not v-shaped or flat/balanced. With that definition, the EPH-100 is the most “musical” of these – it’s the least mid-recessed and not bright, and also has plenty of low end presence. Thanks for the help. If you give the tape mod a try, let us know what you think. The VSD1S comparison in particular. The mid bass isn’t especially heavy on the VSD1S. I guess it’s controlled nature defies the quantity it puts out. Noob question : Differences between splashy and sibilant? Is splasy more-peaky/overall boosted treble? And sibilance? I immediately noticed the longer nozzle. I remember a similar design on my Xears TD4 and they were really comfortable for that reason. The DN2000 should’ve had a design like this. They are both the result of treble peaks/boost, just in different regions of the frequency response. Sibilance is a very specific type of artifact – one that accentuates the “sss” and similar sounds in vocals. Splashiness is not heard in vocals but in other elements – for example the crash and ringing of cymbals being louder and longer in duration than it needs to be. “Needs to be” when compared to benchmark sets, of course. Hard to make a judgment otherwise.